“Caress my darkness, liminal lover” is the title of three paintings by Hedieh Javanshir Ilchi. Each depicts a brimstone hellscape speckled with cypress trees, plumages of seafoam-colored cabbage, and a single imperial gateway arch. The three paintings almost link up to form a triptych, but they fall just short of a three-part sermon on death and the afterlife. It’s better to think of them as three variations on a theme: three arrangements in the round, with no beginning, middle, or end. Everything became nearness and all the nearness turned to stone, the lyrical title for Ilchi’s first show at Hemphill Fine Arts, is full of graphical contradictions and circular motions. Throughout the exhibit, the painter’s atmospheric abstractions clash with representative imagery. In her three “Caress” paintings (all 2016), watercolor washes and poured acrylic share the surface with detailed figures. She depicts those gates, for example, in the painstaking style of Persian gilding and illumination (known as tazhib). Ilchi’s paintings broadly resemble Islamic miniatures rendered as Western Ab-Ex — or vice-versa. This graphical push-and-pull between many cultural traditions in Ilchi’s work reflects her identity. The artist was born in Tehran and studied art in Washington, DC, at the former Corcoran College of Art + Design and at American University. While her palette shifts in abrupt transitions from crystal cool to nearly nuclear, the allusions to her binary identity register as the steady hand in her work. These competing elements are so balanced, in fact, that they sometimes read as neutral or even ambivalent. There’s a single sculpture in Ilchi’s show at Hemphill, a pile of rubble titled “Everything is far and long gone by” (2016). The piece takes on haunting significance following the recent recapture of Palmyra, where ISIS has destroyed so many ancient middle-Euphrates artworks and artifacts. Ilchi’s sculpture is composed of bisque-fired tiles, marked by image transfers and stained with watercolor, tea, coffee, and mixed media. The work is aching; however, the broken tile fragments are too large, and the piece, at the center of the room, doesn’t achieve the same depth and granularity as the paintings that surround it. Ilchi’s paintings are dynamic but also balanced and sure-footed, thanks to her choices in medium. 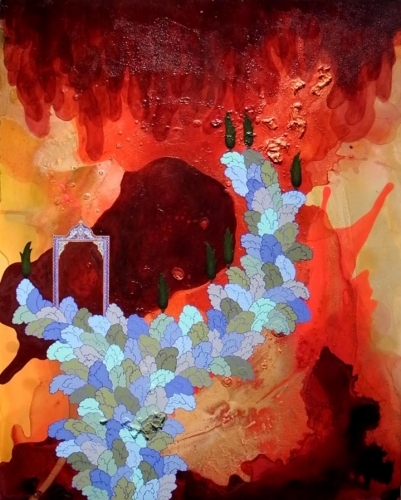 She paints (or, rather, pours) acrylic on mylar for most of her works, including “Simourgh” (2016), which joins together layers of cut-out mylar to create a topographical abstraction. If by pouring, Ilchi is giving away certain decisions, then by cutting and layering the poured-upon mylar sheets, she is reclaiming them. Ilchi is fond of a rainbow ribbon mark-making pattern that runs like a Candyland trail through many of her works, including “How we break and mend and tremble” (2016), as well as the show’s titular painting. Then there are the representational features: the cypress trees, marks that resemble the tail of a griffin, and those arches. Except the latter example, the gates, aren’t representational, really. They are illuminations, a traditional form of geometric illustration that Ilchi has shaped as arches — or as great ovals in “I looked long at the green trees and you looked deeply into my eyes” (2015). Look closely, and the other figurative elements seem to fall away as abstraction, too. Ilchi’s approach to painting is smart, even if her marks are perhaps whimsical and childlike. The repetition in her work means that her paintings sometimes look as though they were assembled from a kit of parts. The show’s standout piece, “Oh, You Wounded Soil, You Wounded Soul” (2015), finds the best tension between abstraction and representation. In it, Ilchi adds a grid that summons to mind both the cool minimalism of Agnes Martin and the decorative tradition of Islamic tile. Her crisp azures stand in vivid contrast to her stormcloud grays; the piece is mature and assertive. Elsewhere in the show, Ilchi shows signs of moving beyond a comfortable abstraction-plus format. (This mode has a long stretch of forebears, from Inka Essenhigh to Laura Owens to Jiha Moon.) “I am silent, for I have seen nothing” (2016), a four-part series of acrylic diptychs pairing what might be a map of the Persian Gulf with a separate abstraction, is a gesture at assigning values to parts of her identity: the ambiguity of borders, the ambivalence of a hyphenated self. With these works she’s also thinking through different methods as a painter, weighing them side by side, not bothering to syncretize the two (or to merely assert them as being reconciled). Ilchi has identified several painterly strategies for putting her different faces forward. The best of her works acknowledge that this project is never finished.